It’s understandable that former SI swimsuit model Kate Upton took a personal stake in this year’s AL Cy Young vote. After all, her fiancé—Tigers starter Justin Verlander—was in the running for the award, and after he went 16–9 with a 3.04 ERA, she probably figured that he was a lock to take home his second Cy Young trophy. But instead, Rick Porcello was named the league’s best starter. 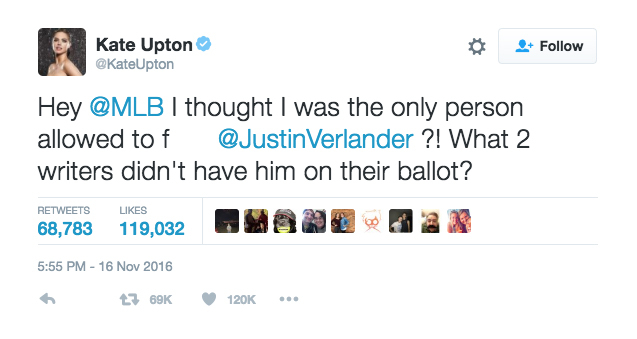 That came as a surprise to Upton, who took to Twitter to blast the Baseball Writers’ Association of America voters—particularly two writers who left Verlander off their ballots entirely—using some less-than-friendly language in the process. Upton later clarified that she meant no disrespect to Porcello, but it’s safe to say she didn’t have much nice to say about the sporting press.